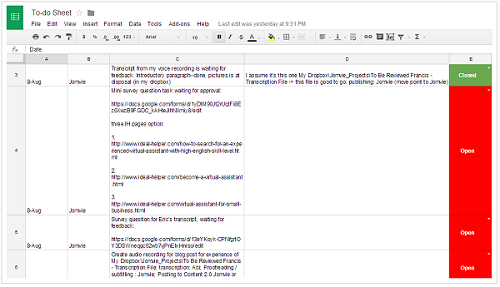 Listened to your latest audio feedback and made a Google spreadsheet as a to-do list. Thus, whenever I or Jomvie has a query, we will put that into that spreadsheet. There are 3 sub-sheets for all 3 of us, all of us can initiate a task or query to others. Had regular Skype sessions with Jomvie and discussed how we will use this Google spreadsheet in order to designate and track projects and questions, and other ongoing projects. Also briefly discussed and explained Form Build It procedure with him. Feedback about pending work updates from Jomvie. I propose that you review and provide feedback to Jomvie on his work updates directly from Google drive, and I will simply upload and publish all his work updates to Blogger. This way you don't have to review them in Blogger anymore. Sometimes I also take out some unnecessary data from his work updates while uploading them into blogger. Moved all of Jomvie's work updates to Uploaded to the Diary folder that I already have uploaded to Blogger. Watched a feedback video which you also shared within my folder and uploaded both work updates that you discussed there. Note: I wouldn't upload any other updates to blogger unless we get a working solution for you to provide feedback on his work updates. Ideal-helper homepage along with some other high traffic pages were also affected by broken grid blocks, so I have fixed most of them by rebuilding those pages, but broken chat box issue is still not resolved for Communication in Business Interview pages. Polished off the post about step-by-step hiring process for a virtual assistant from oDesk and shared with Jomvie so that he can utilize this for credit generation eBook. Watched the follow up video for Jomvi's credit generation post, I think the cost per credit part (along with statistics) was a little confusing, so I reworked on the stats and updated it. About your recently published visitor story "Family vacation in Paris", the submitted image was not original, therefore I have removed it. The other image posted with the "Feet Dare" isn't published anywhere else. However, I have merged the post into another page, "Funny Dares List". Submitted another short post as a comment under "What Truth questions should I ask my friend?". Received two more single-line submissions that I posted into "Great Dares for Girls and Guys".